For better or worse, tracking abilities are a big part of the change in technology used at corporate events. Technology is changing corporate events, and the pace of change is accelerating, according to Brent Turner, a senior vice president at the event marketing agency Cramer. And for better or worse, tracking abilities are a big part of that change. Turner’s agency creates events for clients such as IBM, German industrial company Siemens and investing giant Fidelity that host a few hundred to more than 10,000 people. Organizers, exhibitors and attendees use technology to wring more value out of the event, he said, whether that is finding new customers, making better professional connections or reaching people outside the event. Event-management software began as simple tools to register, view the agenda and find out who else was attending. But new features are continually being added, said Karen Shackman, whose company, Shackman Associates New York, produces about 150 corporate events a year. A variety of vendors offer organizers the ability to create a custom mobile app that includes ticketing, maps, connections to social-media feeds, ways for attendees to connect with speakers and more. Rich Tong, director of strategy for the automotive-software company Xevo, attended the Consumer Electronics Show in Las Vegas in January. So did 182,000 other people. The most important thing to do each day was plan, Tong said, because at such a large event, “you don’t just ‘run into’ people.” Using the mobile event app, Tong tagged the presentations he wanted to attend, the company booths he wanted to visit and searched the online directory for people he wanted to meet. Some organizers prefer to use social media rather than a special app. Jonathan Meyers, general manager of events at CNBC, said that asking people to download and figure out a special phone app for a one-day conference can be a challenge. He prefers to connect with attendees on the platforms they are already using, like LinkedIn and Facebook. “We can invite attendees into social-media groups to communicate with them and use hashtags for social posts,” he said. He said he has found that event-specific apps are rarely opened after the event. “It’s easier to continue the conversation,” he said, through groups created using popular social-media platforms. Connections can be as important as content at an event, and networking tools are designed to help attendees find new customers, suppliers or partners. An app called Braindates lets participants share topics they would like to discuss and then meet in person at a Braindates Lounge, where facilitators act as hosts. A recommendation algorithm offers suggestions of whom to meet. 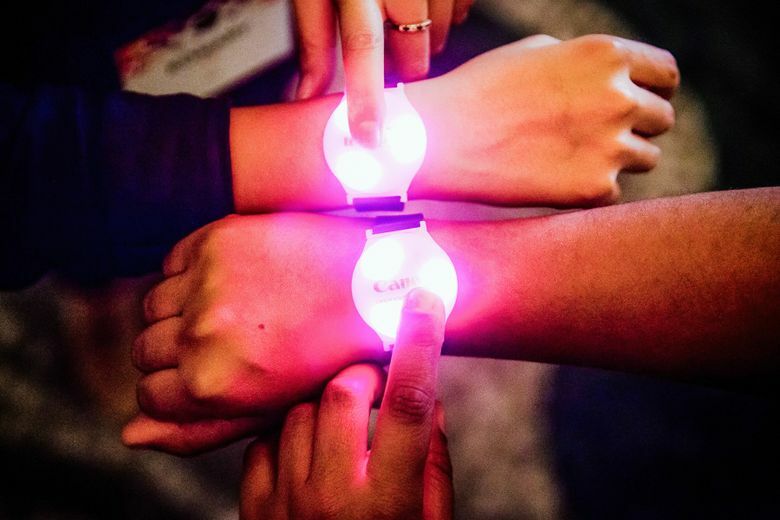 Eventgoers who are using the networking app Klik, and who have agreed to meet, will see their wristbands light up the same color when they are near each other. Hiver, a startup in London, is one of several companies offering a tracking beacon for event attendees. The Hiver beacons can be attached to a lanyard or placed in a badge holder, and when paired with a phone app, will track who the wearer has interacted with at the event and for how long. Attendees can view the list of interactions they have had and the LinkedIn profiles of the people they have met. Exhibitors can use attendee beacon data to see who stopped by their booth, how long visitors stayed, on average, and the busiest times. That information can help companies adjust plans for that conference or other events. Other crowd-measuring devices include tracking mats that count how many people step on them and cameras at charging stations. Organizers can use beacon data to produce heat maps showing crowd flow through the day. That information helps organizers factor in foot traffic when they price future booth location space. Ben Hindman, chief executive of Splash, said the industry has begun to attract more technical people in addition to event managers and party planners. “They want to deliver the right experience to the right person at the right time,” he said.